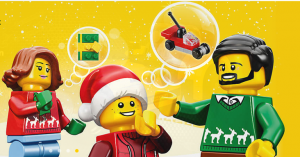 Find LEGO products online and buy from the best online shops in New Zealand. Lego is a very popular line of toys that come from the Lego Group. They"ve been highly popular and beloved construction toys for decades, but the brand and the product have seen a huge surge in their popularity over the past decade or so. Children and adults alike know the familiar logo thanks to the font and colors, and it instantly brings back happy memories for many. So far, there have been more than 560 billion of these little interlocking bricks produced by the company. One of the reasons they remain so popular is because they foster imagination more than many other toys do. The Lego Group started in 1932, when Ole Kirk Christianson started making wooden toys in his workshop. He chose the name Lego because it is a Danish phrase that means, play well? During the first years of the company, they made wooden toys, but they began to work in plastic starting in 1947. They started to make a variety of products in 1949, with the little bricks being among them. They were slightly different from the ones that are available today, but they were the seed of what people know and love today. People of the time thought that plastic would never be able to overtake wooden toys, but Lego soon saw that more than half of their sales were coming from plastic toys. Part of the reason for this is the fact that Ole had a high standard for all of the items that came out of his workshop. Ole"s son Godtfred was the one who actually saw the real potential that the little bricks offered. They redesigned the brick in 1958 to make it easier to use, and this is essentially the same brick style that they make today. In 1969, they created a new product line called Duplo for younger children. These were similar to the Lego blocks, but they were larger and easier for the younger children to use. They also worked as a nice gateway, since many of those children who played with Duplo blocks would eventually move on to Lego. The company started to create mini-figures that they would add to many of their sets. These figures were for additional play opportunities, and they proved to be quite popular. Lego also started making lines aimed toward getting girls to play with the blocks. Some of the other lines they"ve had over the years include Lego Technic, Lego Primo, and Lego Baby. Lego has made a variety of different types of sets that cover a host of different themes. They"ve offered pirate themes, space themes, town and city sets, trains, castles and medieval themes, and much more. They also have a number of licensed sets from highly popular properties such as Star Wars, Indiana Jones, Toy Story, Lord of the Rings, and Harry Potter. One of the interesting things about the company, and Ole Kirk, is that he never wanted his Lego sets to have direct connections to war, meaning that he did not want army figurines sold with them. He wanted to make sure that war was not a part of child"s play. In later years, some of the other licensed themed sets the company offered came close to crossing this line. The sets are interesting and complex enough today that many adults actually buy and collect them. The toys are immensely popular, and today they even transcend plastic. They have been in the videogame market since 1997. Some of their early titles include Lego Island, Lego Creator, and Lego Racers. However, this was just the beginning. Other licenses eventually got in on the Lego action. Some of the most popular Lego videogames today include Lego Star Wars, Lego Harry Potter, Lego Batman, and Lego Indiana Jones. Lego City Undercover was a popular game, as well. There have been Lego movies, including a recent feature film starring the voice talents of Chris Pratt and Elizabeth Banks. Legoland theme parks are very popular with children and adults, as well. Lego offers clothing, board games, and even full retail stores where people can buy Lego sets and other items. The brand is one of the most beloved in the world, and one of the most well known.